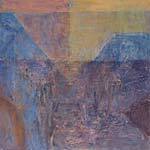 This solo exhibition at the University of Calgary, Mezzanine Gallery was held from March 1 - 31, 2005 and showcased a total of twenty-four paintings spanning the years of 2003 to 2005. I felt that Namaste, a Sanskrit word, which means the spirit in me, greets the spirit in you; was appropriate as a title for this exhibition. The word pays homage to the inner light in all living things. For me, the creative process is a form of meditation and through my paintings, I attempt to express the spirit of form rather than form itself. Each work evolves through the continual application of colour, shape and texture to create an interplay of opposites. My intention is to evoke a poetic visual image, a type of innerscape reflecting rather than describing my perceptual world.